Jockey Corey Brown is hoping English-trained Magic Circle can give him a third Melbourne Cup win. 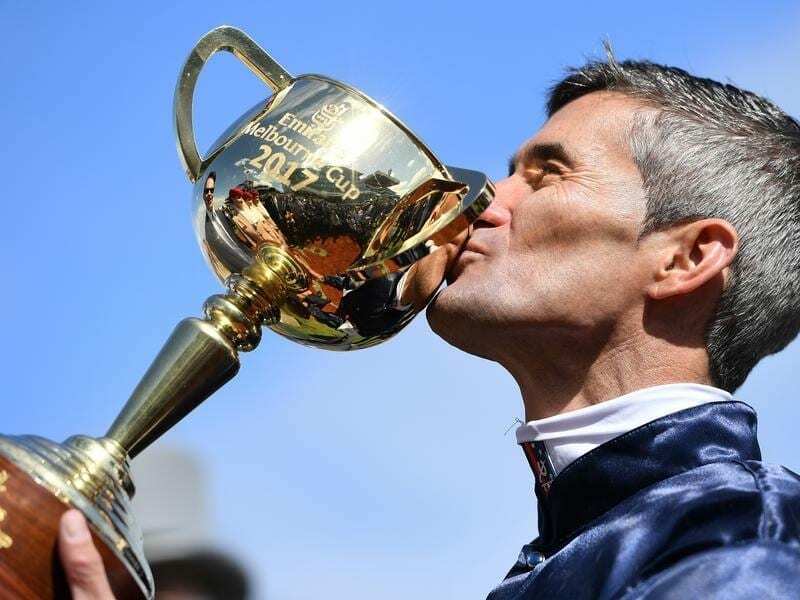 For the second year in a row Corey Brown is pinning his hopes on an international horse as he chases a third Melbourne Cup. Brown has already secured the ride on English-trained Magic Circle for this year’s Melbourne Cup, having won the race for the second time on Irish-trained Rekindling last year. The Sydney jockey has relied on the judgment of his manager Paul Webster to lock in the ride on the Ian Williams-trained Magic Circle, owned by Marwan Koukash who raced Mount Athos, third in 2013. Magic Circle has won the Chester Cup and Group Three Henry II Stakes at his past two starts. “It was my manager’s decision,” Brown said. “We had obviously gone over the videos and watched his last two wins and he sort of ticked all the boxes. “It is quite soon to be taking the ride but my manager is one for one at the moment for me. Brown said he had been impressed by Magic Circle watching the videos of his recent wins. And he said it was actually a relief to have a Melbourne Cup booking for a genuine chance already locked in. Magic Circle was one of five horses on the second line of betting at $21 on Thursday behind joint-favourites Kings Will Dream and internationals Torcedor and Withhold at $14. Brown won his first Melbourne Cup on the Mark Kavanagh-trained Shocking in 2009. “To ride in the race is a big feather in your cap as a jockey, but to win two of them is pretty special,” he said. Brown was speaking at the release of nominations for this year’s Melbourne Cup and Caulfield Cup in Melbourne on Thursday. Magic Circle is one of 50 international entries among the 183 nominations for the Melbourne Cup (3200m) at Flemington which has increased prize money this year to $7.3 million. Magic Circle is expected to go straight into the Cup and is not among the 164 nominations for the Caulfield Cup (2400m) which has had a $2 million prize money increase this year to $5 million. Among the Caulfield Cup nominations are 27 internationals. The all-important weights for both Cups will be announced on September 11.